Think about your love life. Notice any patterns? The way you act around someone you’re attracted to. The type of person you’re attracted to. The type of person that always seems to be attracted to you. Put it all together and you have an attraction profile. Can you see this profile by looking at your natal chart? You bet. Read on to discover how an astrological attraction profile works, and gain some insight into your (or someone else’s) love life. Note: a birth time is required, since this information is based on the signs that the start of each house (the cusp) falls in. Sound confusing? 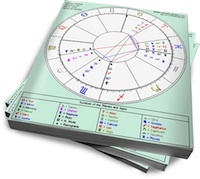 Think of the natal chart as a roulette wheel with the signs spinning around and the houses remaining in one place. The time you were born determines where each sign will stop on the wheel. If you have Pisces in your First House (your rising sign), your Second House will likely start in Aries, Third House in Taurus, etc. The areas of your life that the houses represent do not change, but what you do in those areas depends on the different signs. Taurus 8th house. Since venus is the ruler of taurus, my venus is in the sign of scorpio in the 2nd house, conjunct jupiter and also juno, trine saturn and square my moon in aquarius. So that means that I attract venusian people with scorpio energy? Hi! So since I have 8th house Gemini and Mercury is its ruler. Does it mean I would attract Geminis? I have this one guy in perticular whose sun moon conj. In Gemini. And his 8th hoise is in Aries And Mars is the same sign as my sun merc and Mars. Oh okay, so to see how the 2nd house operates (as you mentioned that it’s how we ATTRACT..) we need to see the planets in there. I have Venus/Neptune conj in there in Saggi. What exactly does it mean? I think you should write a book in this Nadia. I think the whole part about the second house is very enlightening. I was just curious, where does the fifth house fall within that scope of pursuing/courting, and Mars for that matter. How would that blend together with the Second house actions and the second house ruler?